The hotel has perfect location in the middle of the city next to metro station. However, it required some renovation and repair. The breakfast is very good. Building is a cool soviet style building with interesting architecture, but that's about it. Definitely worth a try while staying in Tashkent. Just next to the Amir Temur Square, and you can visit the nearby attractions and museums by foot. Please get this outfit off your list of recommended hotels. There is zero service at this place (service is an alien concept to the staff of this hotel; it is too big, unmanageable, and because it is government owned, the employees do not care about the guests at all. Very poor service, there were no slippers i bathroom. Not so clean. I will not stay at this hotel anymore. The building. It is a busy hotel. I like busy hotels. This is an old Intourist hotel from the Soviet times, a great example of Soviet style hotel architecture. There has been a lot of renovation, but it still feels a bit 'Soviet' here and there. 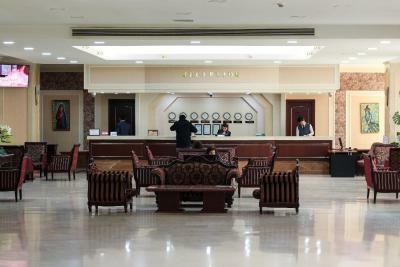 The hotel's location can't be beaten, in the very centre of Tashkent and with a Metro station literally around the corner. 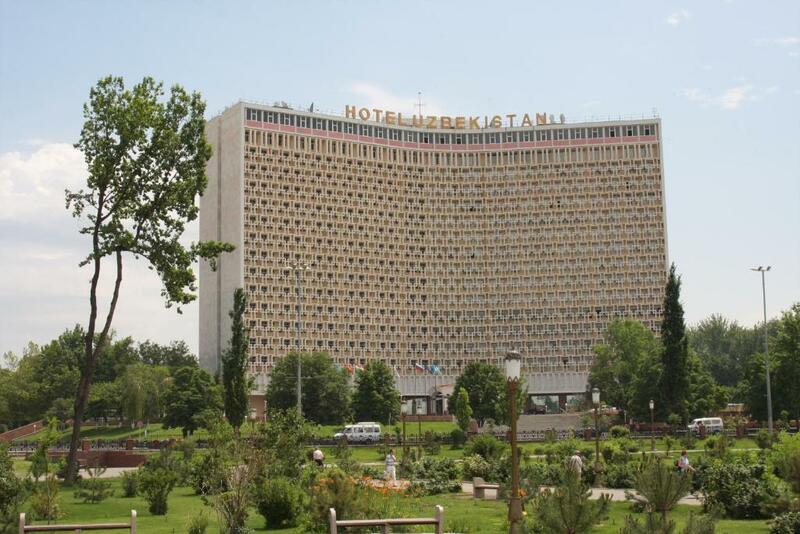 Hotel Uzbekistan This rating is a reflection of how the property compares to the industry standard when it comes to price, facilities and services available. It's based on a self-evaluation by the property. Use this rating to help choose your stay! 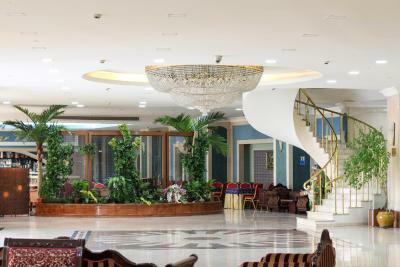 Just 350 feet from Emir Temur Square, this hotel in the heart of Tashkent offers a gym, sauna, and air-conditioned rooms with flat-screen TVs. Guests enjoy free parking and great transport links. 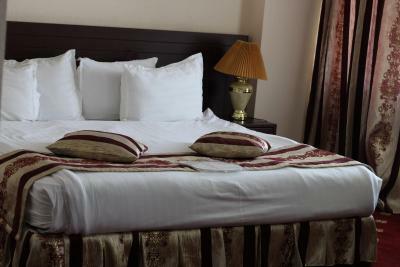 Classically furnished rooms and suites with mini-bars are offered at the Hotel Uzbekistan. Interiors feature dark wooden furniture and fine fabrics, and each bathroom has a hairdryer. European cuisine and local specialties are served in the elegant restaurant with grand piano. The Vena café-bar offers a range of hot and cold drinks, and there is also a snack bar on site. Relaxing and medicinal massages are available at the Uzbekistan Hotel. Guests can also book hairdressing and beauty appointments in the salon. Emir Temur Metro Station is just 350 feet away, and is on 2 different metro lines. 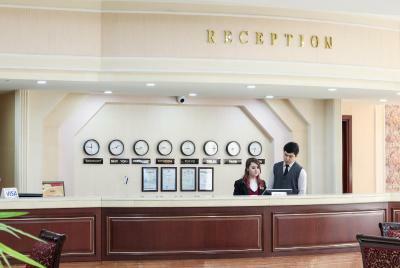 The 24-hour reception staff can organize a shuttle to Tashkent Airport, 6.2 mi away. 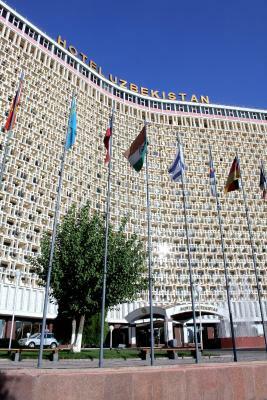 When would you like to stay at Hotel Uzbekistan? Air-conditioned room with dark wooden furniture and fine fabrics. This large single room features a double bed. 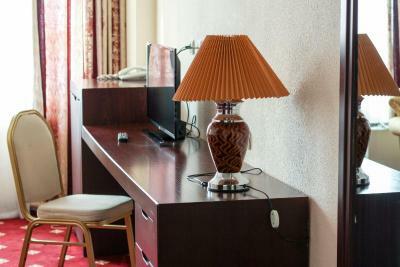 Large, air-conditioned room with dark wooden furniture and fine fabrics. Large, air-conditioned suite with dark wooden furniture and fine fabrics. Includes a separate living room, 2 TVs and 2 bathrooms. Very large, air-conditioned suite with dark wooden furniture and fine fabrics. Includes a separate living room, an office, and a bathroom with large corner spa bath. House Rules Hotel Uzbekistan takes special requests – add in the next step! Hotel Uzbekistan accepts these cards and reserves the right to temporarily hold an amount prior to arrival. The lack of aircondition makes this hotel a no-go during summer months and as Lonely Planet wrote, "don't expect Western level of management" which is true (one example, one evening I could order a meal in the café but the next evening at the same time I was told the kitchen was closed). Wi-fi is only in the lobby. There was a foul smell in the bathroom some times and water pressure in the shower was very bad. It is very obvious that the glory days of this hotel are long gone - unfortunately :( With some more renovation and better management, this place could be a real gem! Excellent location with a very quiet room. Late bar was a bonus!! Reception staff did not offer information about the availability of wifi in our room (password) and told us it was only in the main reception! So we were 24 hours without the convenience of it. 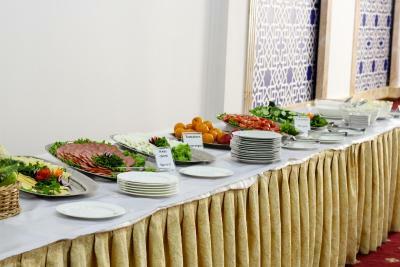 Breakfast is served in the large, shabby function room with numerous 12-person tables. Not an appropriate ambience. The omelettes are good! We were given a suite on the 16 floor which had wonderful views across Tashkent. Very spacious, tastefully decorated room, and large, comfortable bed. Location is excellence, view from room also. If you want to stay in monumental soviet hotel, this is hotel for you. Bed sheets could have been newer and the carpet cleaner. 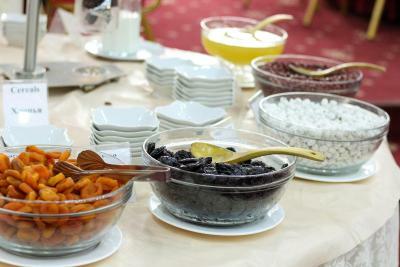 The breakfast is fine, the same every day, no diversity of fruit. The location is the best a hotel can have and actually the best in Tashkent with magnificent view from the the top. Poor value for money. Wifi was not working. Staff was mostly not helpful in arranging taxi (they didn't tell him where to go and he didn't speak English) nor in helping with somehow getting some internet to check a ticket number. Eagerness of staff to make me happy with smiling face. Specialy both shift managers are realy professional in hospitality managemen. Old tired hotel, disinterested staff, no restaurant just a place heating food. Bit value for money. Fairly central. Bar on 17th floor. Near restaurants. Staff are horribly rude at front desk. WiFi is bad abs floors smell like mold in walls. Plumbing issues are consistent in most rooms.